No less than three Shearings' Setras dropped off their passengers at Great Yarmouth's Carlton Hotel late this afternoon following their respective outings. The first two arrived together and both wore Grand Tourer branding; 109 (BK109RNF) led 206 (BK10EJG) into Kimberley Terrace from Marine Parade and both are seen above unloading passengers at the Carlton's main entrance. 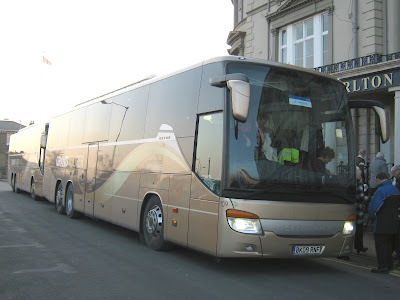 Some 15 minutes later another Setra, 320 (BK11CPV), took the same route and is also pictured above unloading at the hotel. Two of the three coaches parked up at Beach Coach Station whilst 109 remained in the car parking area close to the hotel. 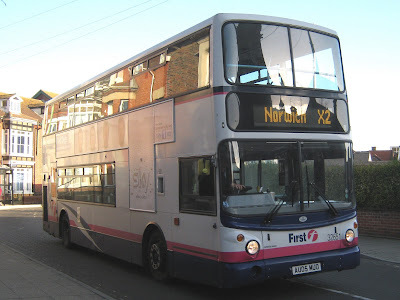 Previously unreported is the news that First's Leyland Olympian 34333 H132 FLX departed Caister Road on the afternoon of 17th January. The surprise is that she was destined for Colchester for further use and not the scrapyard! On arrival she had to be reversed into the depot from the yard end as she is too high for access via Queen Street. 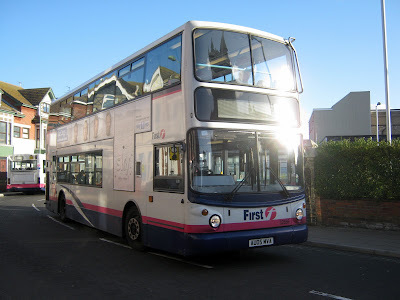 Late yesterday afternoon, she was observed working the 76 service between Clacton and Colchester. On a flyimg visit to town this afternoon, I observed Belle Coaches Mercedes Vario 49 (BE10LLE) sheltering from the rain beneath Market Gates Shopping Centre. After almost a week out out of circulation (due to illness) I decided to visit Great Yarmouth to see what was on offer buswise. An early afternoon visit to Beach Coach Station yielded nothing, although two First double deckers on Bernard Matthews workings stopped outside on Nelson Road North to pick up passengers. 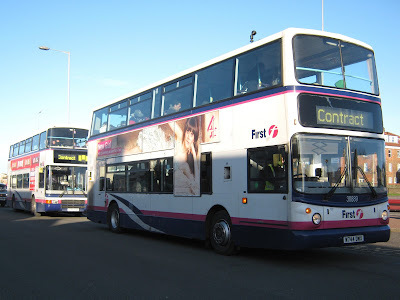 They were Volvo B7TL 30889 (W744DWX) and Volvo Olympian 34186 (S686AAE) as shown above. Following a stroll along Marine Parade, I made my way back to the town centre. On Nelson Road Central I was passed by Shearings Setra No 206 (BK10EJC) in Grand Tourer colours on its way to Beach Coach Station. On the bus home, Anglian Dennis Trident ALX400 No. 512 (V161MEV) was passed on Southtown Road heading into town on the 601 service from Southwold. 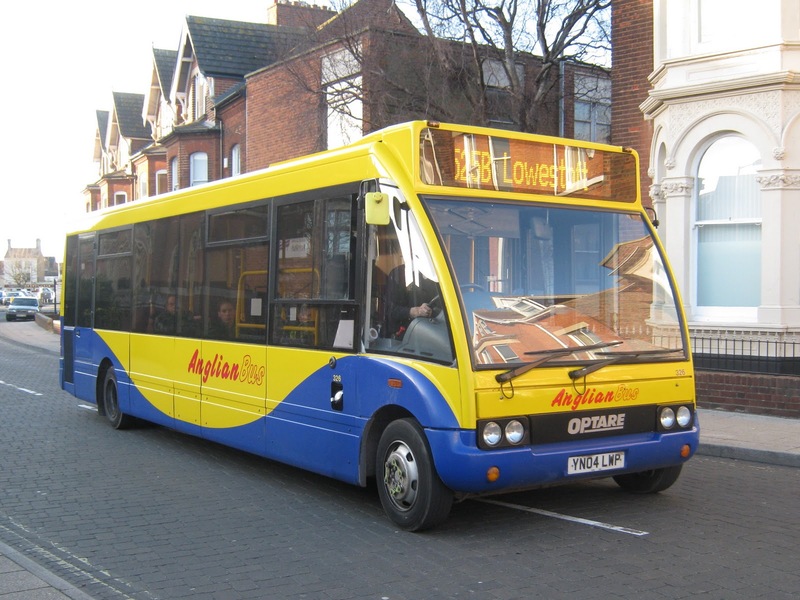 Another Anglian vehicle was seen in Gorleston High Street; Optare Excel No.400 (X228WRA) was on the 16:06 A47 Gorleston to Norwich. The Excel was a regular performer on this route during the latter part of last week. 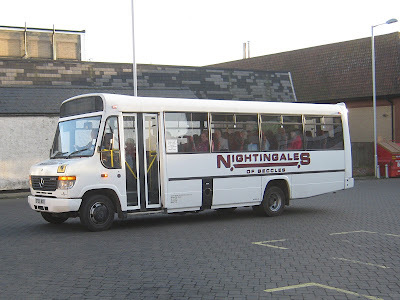 Earlier in the month the East Anglia Transport Museum, based at Carlton Colville in Lowestoft, announced details of its events planned for 2012. The museum will be marking the 50th anniversary of the end of the London Trolleybus system over the May Bank Holiday weekend. As part of the celebrations a number of visiting London Trolleybuses and London Buses will be in attendance. 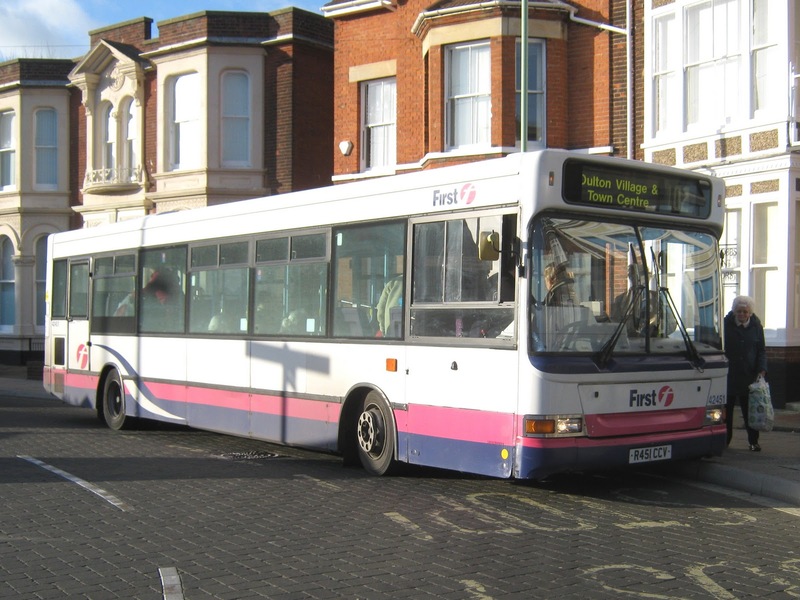 In June, the bus weekend celebrates 25 years since the closure of Lowestoft's Eastern Coach Works. The event will see a gathering of ECW buses and coaches from around the UK. The highlight will be on the Saturday evening when there will be a cavalcade through Lowestoft to the site of the works. Looks as though it will be a very interesting event. 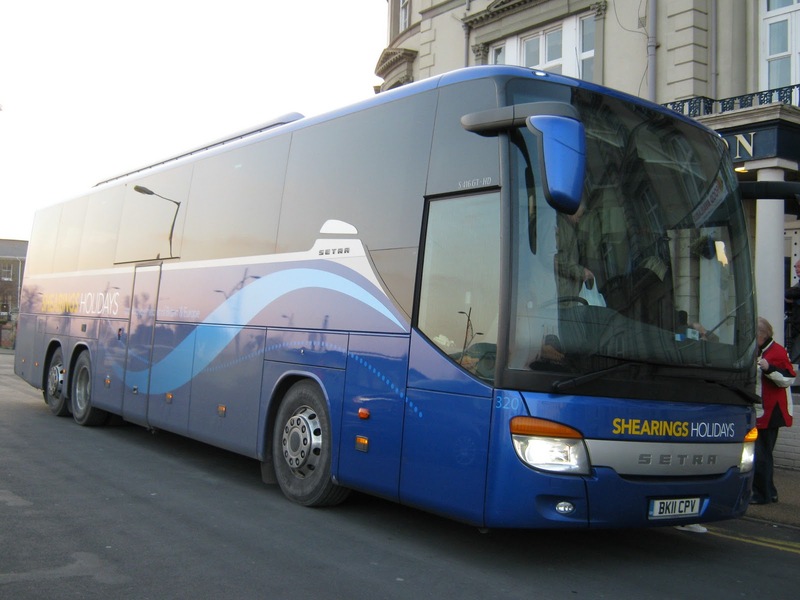 Following the sale of ten of its vehicles by auction in August last year, Swift have announced that they wish to dispose of the only double decker in their fleet. Graham Bessey writes to inform me that he visited a sunny Dereham on Friday and has supplied some photos of workings there for the blog. 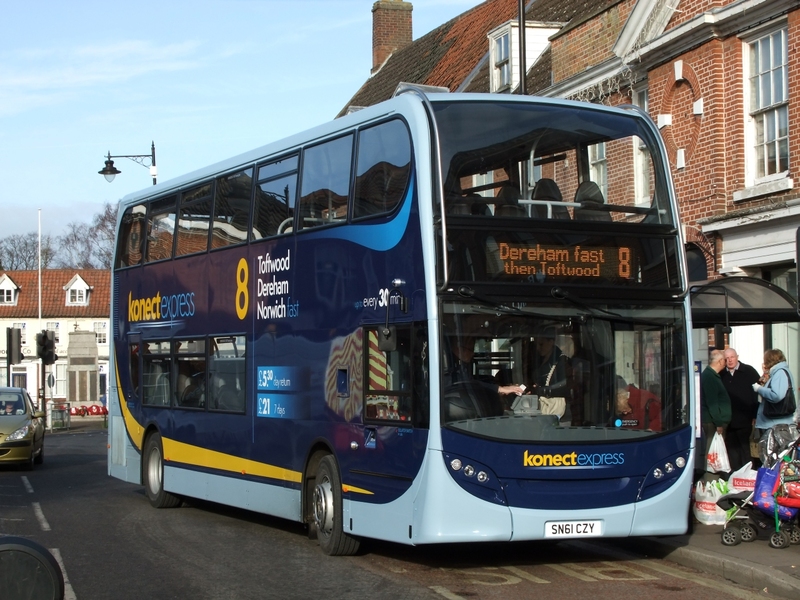 The first is that of Konect's new ADL Enviro 605 (SN61CZV) in the new 'konect express 8 livery' arriving at Dereham Market Place. Also pictured at the Market Place was Konect's Volvo B7TL 701 (V301LGC) on the Highfield Road Circular. Many thanks to Grahame for the photographs. 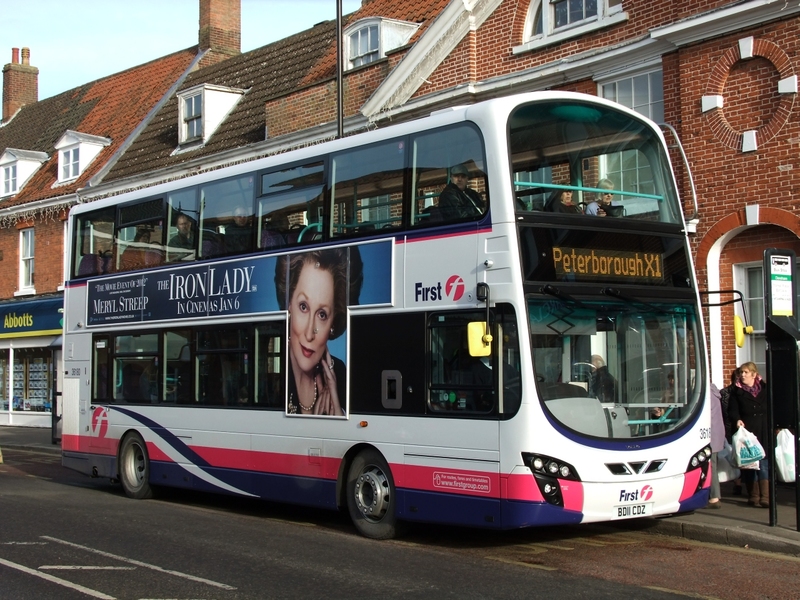 The Ipswich Evening Star reported on Friday that First is to withdraw its bus services in Bury St Edmunds and also close its depot in the town. First issued a statement saying “Operations at Bury St Edmunds have not been commercially viable for some considerable time, and with continued cost increases facing the industry plus the Government’s decision to reduce the BSOG (Bus Service Operators Grant) by 20% from April 2012, it is with regret that we have decided to withdraw all services at the end of March"
Speculation is now rife as to where First may pull out of next! ﻿﻿Swavesey operator Whippet Coaches have recently announced details of their 2012 coastal services. The weekday Service A between Huntingdon Bus Station and Great Yarmouth commences from 1st May with all passengers needing to change at Newmarket. The Saturday service begins on 14th April. The Sundays only Service G operates between Cambridge and Great Yarmouth and runs from 15th April to 30th October. Service H runs to the same timetable as last year with operating dates on Tuesdays only from 24th July to 28th August. 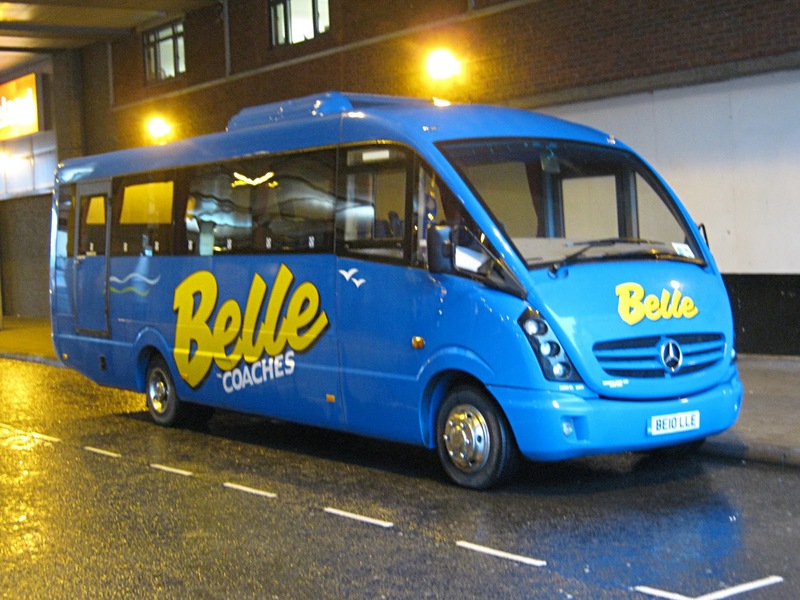 For further information please visit the Whippet Coaches website where individual timetables can also be downloaded. Former Swift Dennis Dart S511XCR is now in service with new owners Shaws of Maxey. Its Caetano Compass bodywork is now mainly in a white livery complete with a blue skirt. It is pictured at Shaws' premises yesterday. 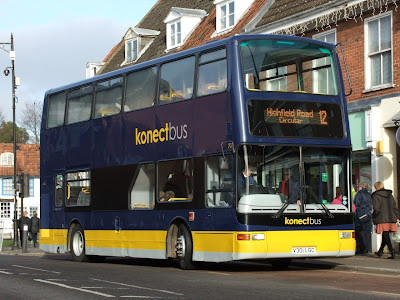 On the subject of seeking out former Swift vehicles disposed of, GHA Coaches of Corwen was reported in the November issue of Buses of acquiring Volvo B10M/Jonckhere M735KJU. 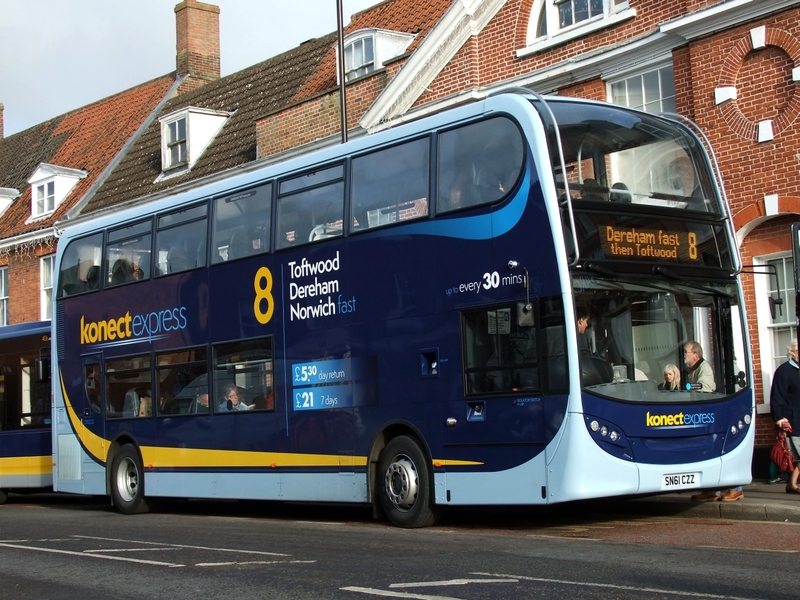 Sixteen bus services in Norfolk are to lose subsidies from the County Council as it looks to save half a million pounds. 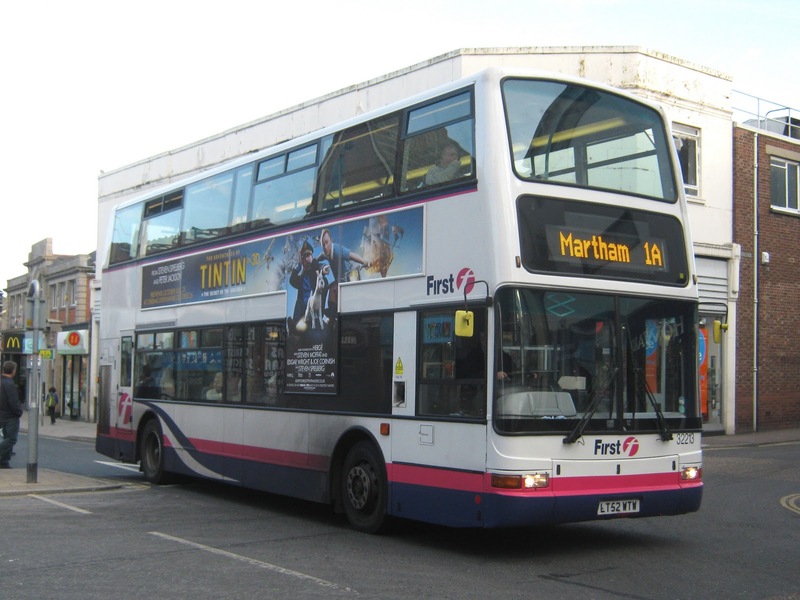 It will mean fewer services on those routes, with journeys in the evenings and on Sundays among the trips being lost. The county council had put the routes out for consultation, but has not altered its original plans as a result and is set to agree the cuts when it sets its budget next month. If the budget is agreed at full council on February 13, the changes will come into effect from Thursday, April 12. Sanders 5. Holt - Cromer - Mundesley - North Walsham. Fewer Sunday journeys from October to May. Sanders 5A. North Walsham - Coltishall - Spixworth - Norwich. Fewer Sunday journeys. First 6,7. Belton and Bradwell - Great Yarmouth. Fewer evening (after 7pm) journeys. Anglian 581. Beccles - Burgh St Peter - Great Yarmouth. 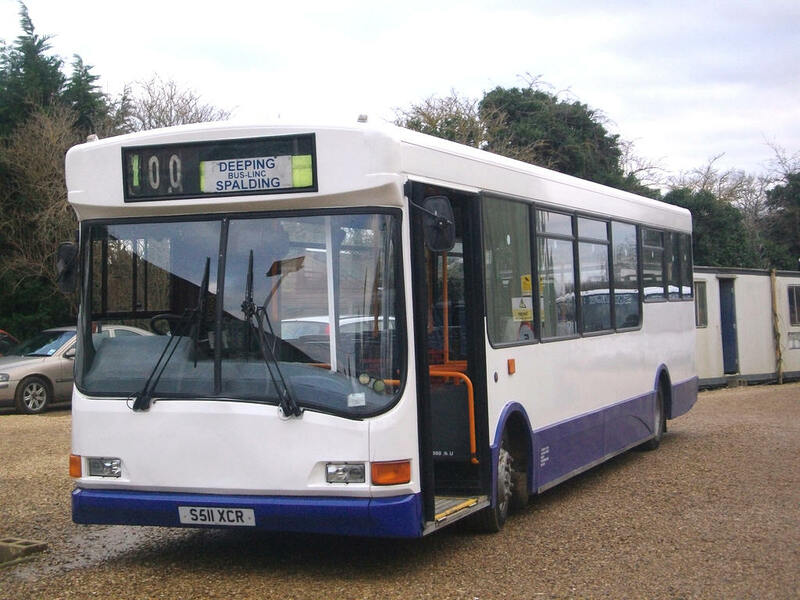 Wheatacre, Burgh St Peter and Aldeby to be served by alternative pre-booked transport. Spent some time in Lowestoft today and in between the shopping there was some time for some observations in the Gordon Road area in or near the bus station. In the opposite direction former Great Yarmouth Dart 42451 (R451CCV) was loading its passengers for the 13.43 102 service to Oulton. At just before 14.00, one of Anglian's Optare Solos headed for the bus station on the 525 route from Carlton Colville. It was 326 (YN04LWP) acquired from Veolia in September last year. Early this morning a tour round Great Yarmouth's usual haunts for coaches revealed two National Holiday representatives. YC02CFK was seen on Marine Parade heading for the Carlton Hotel to pick up passengers at the end of their tour. 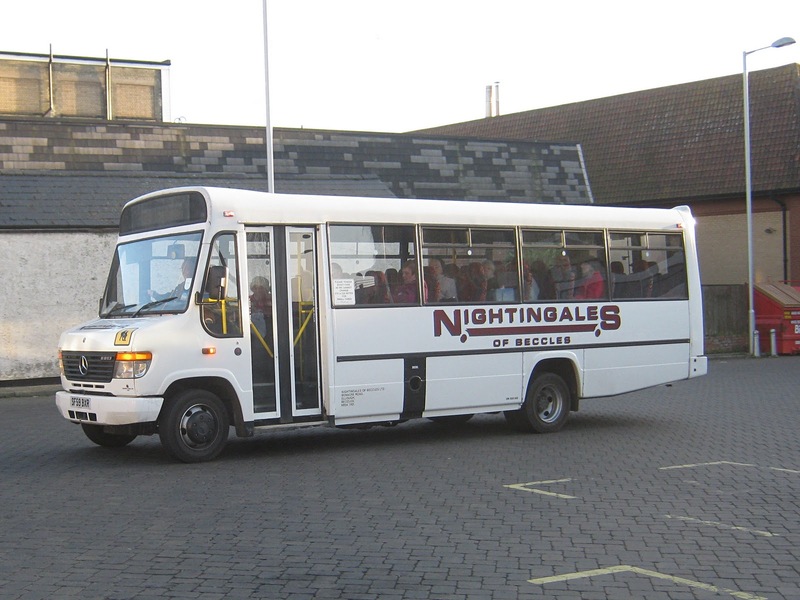 The photo shows the Volvo B12M outside the hotel awaiting luggage for the homeward journey. 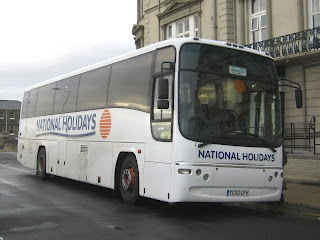 Meanwhile, sister NH05CDH was the sole occupant at Beach Coach Station. ﻿﻿﻿﻿﻿﻿﻿﻿﻿﻿﻿﻿Grahame Bessey reports that First Suffolk & Norfolk made some re-allocations to its local fleet over the holiday period. Former Kings Lynn stalwart 30888 (W743DWX) has moved from Great Yarmouth to First Essex. In its place comes another Volvo B7TL 32213 (LT52WTW) from Norwich. 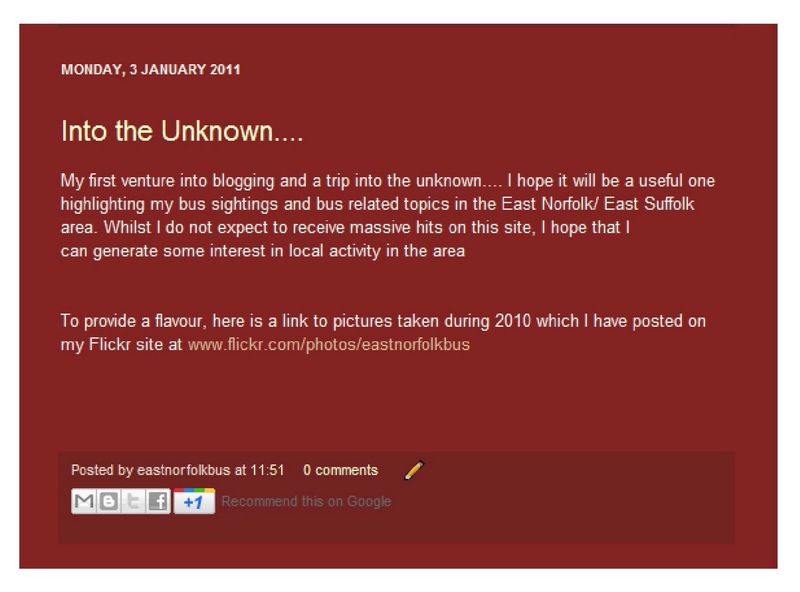 Its not a stranger to the town having been used on the 1/1A whilst based in Lowestoft last year. Leyland Olympian 34333 (H132FLX) has again been withdrawn from service following its temporary reprieve working Bernard Matthews contracts in the period leading up to Christmas. Today is the blog's first birthday. It doesn't seem that long since I started on this journey and what a journey it has been. 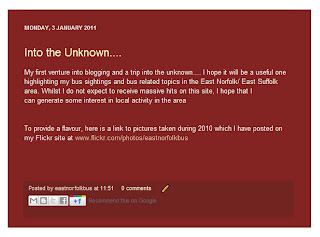 Whilst the number of visits to the blog haven't been earth shattering, the number received has been surprisingly high. As expected, most of the page views (80 per cent) have come from persons based in the United Kingdom. The USA was second placed with, no doubt, a high number of visits from a former Great Yarmouth resident now living in North Carolina! Europe was also significantly represented with a large number of hits from Germany, the Netherlands and Italy. The eastern hemisphere figured strongly with visits from India (ranked third), Indonesia, Pakistan and Singapore. Surprisingly Russia was placed 5th! What were you all looking at then? Well my Italian Holiday attracted the most number of visits, followed by More Shearings and Busy Beccles. Also following closely behind was June's Bus Event at the East Anglia Transport Museum and a Dull Day at Dereham - which was anything but! Thank you all for your interest and support over the past twelve months - let's hope the coming year will provide as much (if not more) interest in the local bus scene.